Clears up your skin’s texture, helping you feel beautiful! Completely revitalise your body with the power of select ingredients. Contains vitamins, minerals and antioxidants to assist your wellbeing. A cup of this will help keep you hydrated throughout the day. 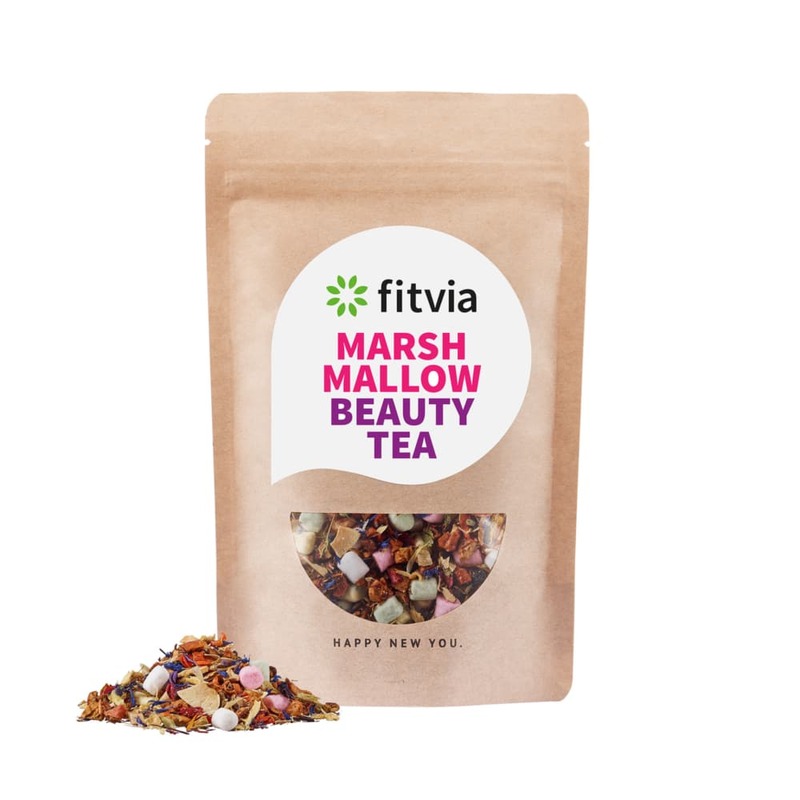 Feel gorgeous with our brand new Marshmallow Beauty Tea! Made with delicious marshmallow bits and purifying ingredients such as papaya, vanilla and rosehip, this tea encourages clear skin and thick, healthy hair. Steep for 8 minutes for the best result. Provides an incomparably sweet, tasty flavour. A flavourful exotic favourite packed with vitamin C.
Redcurrants help you get glowing skin with B vitamins! Blueberries are incredibly rich in vital antioxidants! Apple pieces (apple, acidifier: citric acid), candied pineapple pieces (pineapple, sugar), marshmallow (glucose syrup, sugar, dextrose, water, humectant: sorbit, gelatine, flavouring, colourings: cochineal, curcumin, chlorophyllin copper complexes) (10 %), candied papaya pieces (papaya, sugar), grapes, natural flavouring, orange peel, rosehip peel, beetroot pieces, blueberries, vanilla pieces (1.5 %), cornflower flowers, marigold flowers, marshmallow leaves, redcurrants.